When do you talk to your BF about kids? Comedian Chelsea Handler just admitted that she doesn’t want to have kids. We’re pretty sure her boyfriend feels the same way, but when is the right time to bring up the kids-or-no-kids question? Chelsea Handler wants to make one thing clear: She’s not having kids… like, ever. “I don’t think I’d be a great mother,” the 38-year-old told talk-show host Amanda de Cadenet last week. 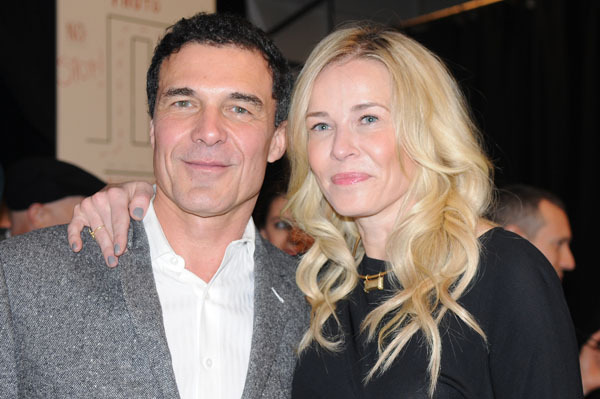 We’re pretty sure her boyfriend, hotelier André Balazs, is down with the decision, given that he’s 58 with two daughters from a previous marriage. But, what happens in a relationship when you have differing opinions about kids? Take Eva Mendes and Ryan Gosling for example. The Place Beyond the Pines pair seem to have differing opinions on kids, judging from past comments. Gosling, on the other hand, can’t wait to have children. The two are pretty serious, so we have to wonder if they’ve had that “talk” yet. And yes, it’s possible that Mendes could change her mind, but not necessarily — and neither side should have to “give in” just because the other does (or doesn’t) want little mini-mes running around. So, we want to know: At what point do you bring up kids in a relationship? Is it a deal breaker if he doesn’t want them and you do (or vice versa)? Is it ever OK to kiss and tell? Does it matter if you’re more sexually experienced than him?